In our work, we are inspired by the beauty and changing moods of the natural environment and by our own photography and love of nature. All the arts, especially music, dance and the visual arts, support our work. Additionally, the angst, depth, joys and blessings of life experiences find expression in our creations. 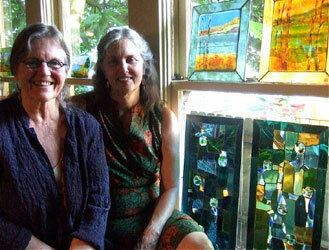 We are moved by the regenerative and meditative quality of the creative process and the magical illumination of glass. During different periods of our lives we maintained parallel careers in the expressive arts therapies and psychotherapy. This has deepened our own artistic expression and expanded our understanding of the healing potential of glass and the transforming effects of the art process.